Driving along Route 44 in Bolton, motorists travel through a narrow passageway of rocks, caves, and woods known as the Bolton Notch. Most likely carved by a pre-glacial stream, the area was once home to Quarryville, a bustling 19th-century community centered around the commercial quarry industry. The first record of a quarry contract in Bolton dates back to 1809. The granite found in town was of good quality and in high demand for building and sidewalk construction. 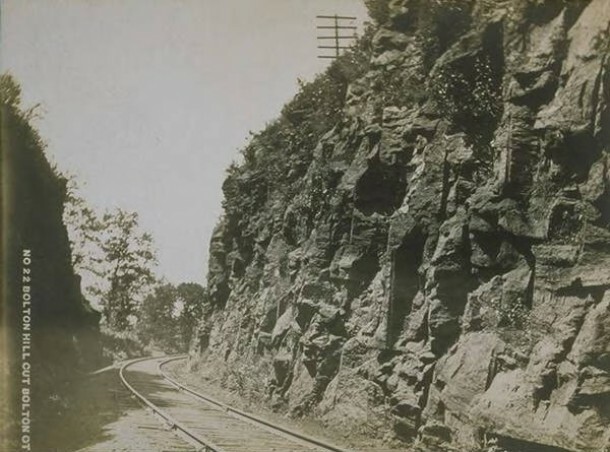 Quarrymen mined the granite and shipped it by oxcart to the Connecticut River where boats carried the quarry stone to cities up and down the East Coast. In addition, local flagstone used in door stoops and school blackboards found its way from Bolton to cities like New York, Philadelphia, and Baltimore. By 1820, Quarryville was a booming village and transportation center. With the arrival of the railroad in the mid-19th century, the area reached new heights of prosperity. Railroad workers flush with cash helped support numerous taverns, a church, and a post office. New residences brought more businesses, and in 1913, the Norwich Turnpike was redirected to the area from Bolton Center. By this time, the Bolton Notch housed 26 buildings, including grain sheds, a soap factory, and a village store. Unfortunately for the men and women who benefited from the local quarry industry, it was at this time that numerous factors, including a number of dramatic weather events, began working against them. The Bolton Lake dam gave way after a hurricane in 1938, destroying numerous properties in Quarryville. Eighteen years later, in 1956, another hurricane washed away a vitally important railroad bridge in Putnam. The quarry industry in Bolton Notch never fully recovered. Today, with only one of the original 26 buildings remaining, the area is a part of Bolton Notch State Park. Here the Connecticut State Department of Environmental Protection preserves 95 acres of woods, hills, and a hiking trail established on a section of old railroad bed. “Bolton Historical Society,” 2012. Link. De Pold, Hans. Bolton: Historic Tales. Charleston, SC: History Press, 2008. Sunday Funday? We Think Not – Who Knew?